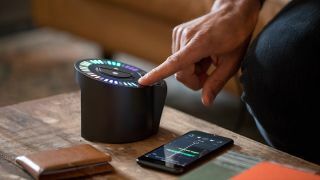 iZotope's has removed the technological barriers between having a song idea and capturing it with Spire Studio, a wireless hardware product that integrates with its Spire multitrack recording app. And now, for a limited time, you can get it for just $299, a saving of $50 on the regular price. Designed as an alternative to traditional recording setups, this portable device has a built-in microphone and runs on a rechargable battery that lasts for over four hours (a power supply also comes in the box). It offers six hours of recording memory and operates at 24-bit/48kHz. Two XLR/combo jacks enable you to plug in external mics and other instruments, and there are also two stereo mini-jack headphone outputs. The hardware features iZotope’s “intelligent audio processing” and offers mic preamps from Grace Design. There’s a touch-sensitive LED display for adjusting the headphone volume and selecting/muting tracks. When you want to go deeper, you can integrate Spire Studio with the Spire app using the built-in Wi-Fi. As well as being able to record, mix and share your songs, you can also collaborate with friends and export stems for importing into your main DAW. As we said in our review, Spire works brilliantly and is great for capturing ideas fast. Click through below to get it for the knockdown price.